I met Shaun in April 2017 on my 62nd birthday. 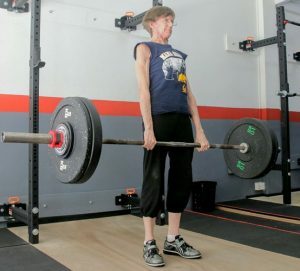 My doctor had just recommended weight training to improve my bone density, so when Shaun opened his new gym on Haig Road it was perfect timing for me. Although I had worked out on weight machines in the past, I had never considered using barbells. This was new territory for me. Using the Starting Strength programme, Shaun started at the very beginning, patiently explaining each movement. 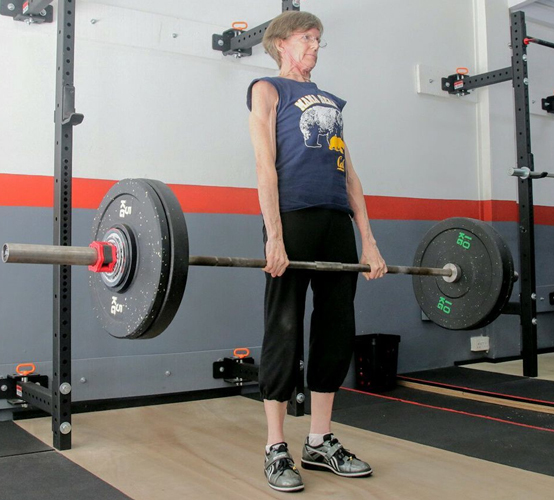 They all felt strange initially, and I was pretty sure my knee problems and shoulder pain would mean that squats and overhead presses would not be possible, and how could a deadlift be safe for my back? But while my muscles were tired after each workout, I never experienced pain. I realised that Shaun’s careful attention to form meant that I was able to do the movements safely and to gradually lift heavier weights without injury. Shaun has also been very helpful with ideas on how to continue training when I’m overseas. He sends WhatsApp feedback and encouragement regularly. I feel stronger and more confident about how to safely move my body and lift heavy things in my daily life. While my main goal is to improve my strength and bone density,it’s been motivating and fun to work towards mini challenges along the way. Earlier this year I deadlifted my body weight, which I never expected to do. My whole family was impressed. Now I deadlift more than my body weight every week. My new goal is to achieve one unassisted chin up, and I can see that I’m getting close. Thank you Shaun and Starting Strength!